For expectant mothers, the excitement of pregnancy is sometimes offset by anxiety over medication they require. Parents and doctors often have to consider the mother’s health as well as the potential risk of how medication could affect the baby. The U.S. Food and Drug Administration requires certain drugs to be labeled regarding pregnancy exposure and risk. Some drugs are labeled to show that testing on animals has failed to demonstrate a risk, but there are no adequate and well-controlled studies of pregnant women. Ma and his research team in the System Tissue Engineering & Morphogenesis (STEM) lab have been working with human-induced pluripotent stem cells to study tissue regeneration, regenerative medicine and stem cell engineering. “This type of stem cell has the ability to generate all the different cells in a human body. Because it was derived from humans,” says Ma. Pluripotent cells can be used to create heart tissue, but Ma’s research team believed they could take it even further. Ma’s research team developed a process that combines biomaterials-based cell patterning and stem cell technology to make a 3D tissue model that could mimic early stage human heart development. By starting with a layer of polymer in a tissue culture dish and etching tiny patterns in the polymer, the stem cells will only attach within those patterns. Since the stem cells do not attach to the polymer, they grow within the patterns and eventually develop into a three-dimensional structure that has distinct tissue types. The process developed by Ma’s team focused on cardiac tissue, but other labs could adapt it to other tissue types and even organ tissues. 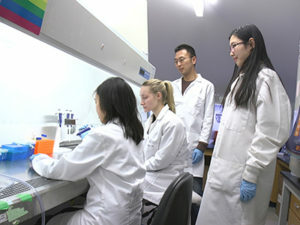 Their research was published in the March 2018 Nature Protocols journal and featured on the cover. The platform allows tissue to form during the cell differentiation process rather than building tissue out of already-established heart cells. Tissue that forms during the differentiation process has more layers and more accurately represents how tissue naturally develops in humans. “Using the cell lines we use, they are human based so we know they will affect human tissue in a certain way as opposed to the uncertainty that comes with an animal model,” says graduate student Plansky Hoang. Some pregnant women avoid taking drugs they need to manage chronic conditions, but if the mother’s health suffers, that can also affect her baby. More reliable test results could provide more confidence for both patients and doctors. Embryotoxicity is just one potential use of the modeling platform developed by Ma and his team. Countless other human tissues could also be cultured using the process. It could also allow for individualized drug toxicity testing for humans. Different people can have different reactions to the same drug but personalized testing using someone’s stem cells could help determine if a drug is safe for them before they take it.